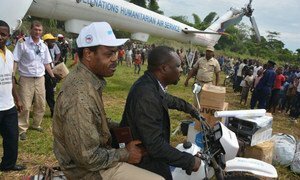 Representatives of the Ministry of Health in the Democratic Republic of the Congo (DRC), WHO and UNICEF arrive at Likati, the epicentre of the Ebola outbreak . To contain the latest outbreak of the Ebola virus in the Democratic Republic of Congo (DRC), the United Nations Children’s Fund (UNICEF) provided technical support to 145 volunteers of the Congolese Red Cross and community health workers to deliver lifesaving information to local populations in remote areas along the Central African Republic border. “Working in close collaboration with health workers and communities was the best way to inform the public quickly about protection measures against Ebola, and to prevent propagation of the disease,” said Christophe Boulierac, UNICEF spokesperson, during a regular briefing in Geneva. Under the coordination of national health authorities, and in collaboration with the World Health Organization (WHO), UNICEF trained on how to chlorinate water and disinfect homes to avoid the spread of the disease, as well as on the importance of hand washing and ways to adapt local burial practices to reduce contamination risks. Encouraging people to visit their local health centre in case of illness during the epidemic, the DRC Government decided to make the health services available free of charge in the affected health zone of Likati. In addition, a European Union-funded flight helped UNICEF send supplies and medicines to health facilities in the Likati area. “It was a very hard-to-reach area and teams could only access it by motorcycle and on foot. This limited propagation of the disease, but also presented an additional challenge for bringing in medical supplies,” Mr. Boulierac elaborated. He also stated that as of that same time, there were still 294 contacts under follow-up, and as many cases had already been dismissed, it was important to look into various other options. “A number of diseases could be responsible, such as hepatitis B, hepatitis C, hepatitis E, yellow fever, shigella, typhoid, dengue, and salmonella. Individual cases in the different villages could have different pathogens,” he explained. Asked about vaccination, Mr. Lindmeier said the protocol for the possible ring vaccination had been formally approved by the national regulatory authorities and the DRC Government with Médecins Sans Frontières (MSF) along with WHO support. He added that other partners were working on detailed readiness planning for experimental vaccine use, to deploy as soon as possible, if needed. The international vaccine deployment and cold chain shipment to DRC was not advised at this point, as there were only two confirmed Ebola cases and no new cases had been seen for a while now, he pointed out. “There is no automatic trigger point for the ring vaccination, but the moment there would be a new case it would be looked at very carefully,” he said. The authorities, MSF and WHO and partners were in constant contact on this.